The archaeological site of Prečno pole I lies to the north of the village of Torčec in the Koprivnica-Križevci County. The site has been known since 1997, when surface finds were first collected, while a field survey of a broader area carried out in the autumn of 2002 ultimately led to a systematic four-year long archaeological investigation. A total of 7 trenches were excavated, covering an area of 1635 m2, in order to identify early mediaeval settlement structures. 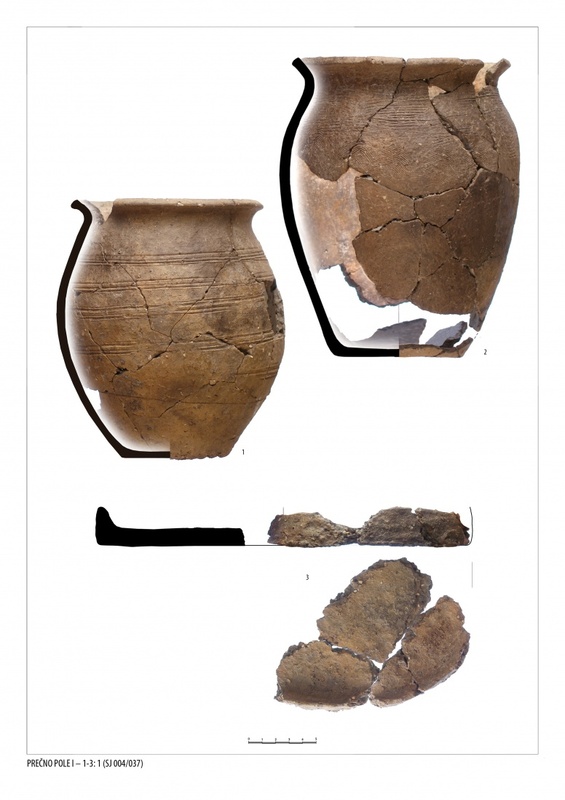 Five different ceramic groups were distinguished based on an analysis of the ceramic assemblage from the investigated part of the site. 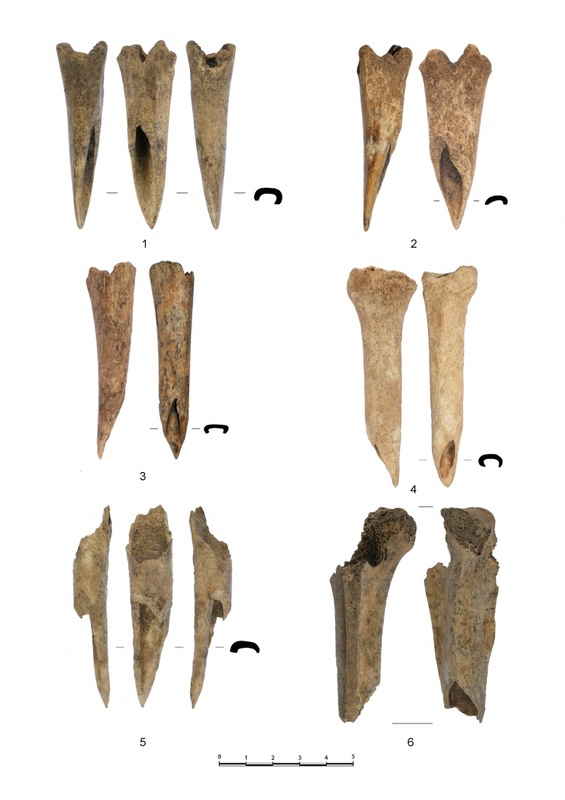 The remaining analysed finds from the structures were added to these groups. 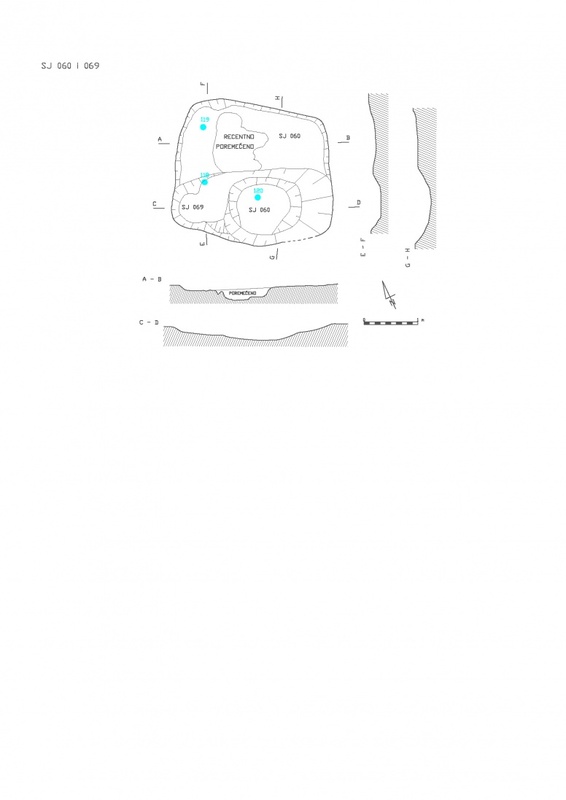 Based on this, a horizontal stratigraphy of mediaeval structures at the site has been put forward, consisting of five distinct habitation phases, corroborated with 14C absolute dates. The most represented were the first three phases (I-III), while the habitation phases IV and V were sporadic, with only a few occasional features of unknown function. It was possible to follow the sequence of habitation from the end of the 6th century and the beginning of the 7th century (phase I), to which only two investigated contexts could be attributed, separated by a distance of around 150 m. Within one of these contexts it was possible to recognize a slightly sunken residential structure of medium size, a rectangular layout, with a circular hearth in the southern part. The pottery from this habitation phase is hand-made, mostly undecorated, with a fabric that significantly differs from the remaining younger pottery from all the other structures. The households used ordinary cooking pots, while no other forms were documented. A fragment of a two-row bone comb can be singled out. The second horizon (phase II), from the first half of the 7th century to the mid-8th century, is present in the investigated area with 9 investigated contexts, one of which has been identified as a slightly sunken large residential structure of rectangular layout. A self-standing stone oven was discovered adjacent to one of the structures. Ceramic pots from this phase were made on a slow-rotating wheel, and start to be decorated, especially on the upper parts and on the edge. Objects used in the household include also baking pans. In addition to this, bone tools – thatching needles can also be singled out. Structures from the third phase are divided into two groups, an older one—from the end of the 8th century until the latter half of the 9th century (phase IIIa)—and a younger one, from the end of the 9th century and the first half of the 10th century (phase IIIb). A feature of the older subphase is the emergence of medium-sized and large square semi-sunken structures. 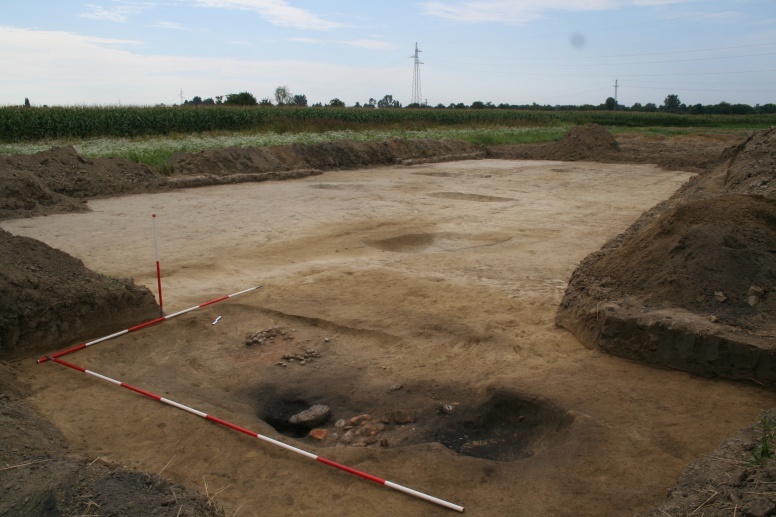 Two such structures were very well preserved, both situated along the edge of an old meander of the Drava river. The houses had massive wooden supports for the roof. The hearth found in one of the houses consisted of pebbles arranged in a semicircle. Based on the find of daub with impressions of wide wooden planks of regular width, it is presumed for the houses with wooden roof supports that they had walls that were only slightly raised above the walking surface. A feature of the younger subphase is the emergence of smaller semi-sunken residential structures of a square plan, with a hearth in one of the corners of the house, again without roof supports. The main feature of phase III is the joint presence of ceramic pots made on a slow-rotating wheel with features of the previous phase, as well as those made on a fast-rotating wheel in the same structure. The layout of the investigated structures shows that they cluster along the bank of the meander, and that the remains at Prečno pole may be characterized as a rural settlement of the dispersed type, in which the population continued living through subsequent centuries (phase IV and V), for which there are indications in the conducted investigations.